It took a while, but we are finally there. 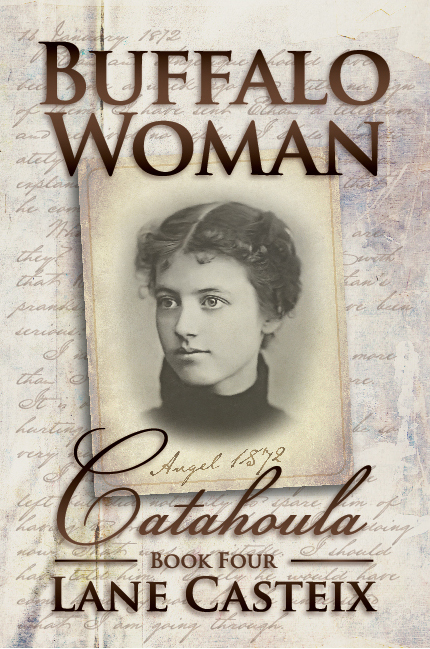 Book 4 of the Catahoula Series, Buffalo Woman, is now live on Amazon. This is the fourth in the series and takes our heroes forward five years to 1872 and the tour of America by Grand Duke Alexei of Russia. Ethan and Angel get sucked into his vortex and head out West to go buffalo hunting and then New Orleans for Mardi Gras. I have posted excerpts from the book here, here, and here, and below is another. This one finds Angel demonstrating her skills with the sling to the Grand Duke’s party. Enjoy. Alexei then remembered Angel’s claim of her prowess with the sling and that he had previously requested a demonstration. “Miss Angelique, you told me you could hit a pigeon at thirty paces with your sling. Would you be so kind as to demonstrate the weapon of King David for us?” That was followed by a few shouts of encouragement I imagine meant to express doubt that she could do what she said. She stepped forward and bowed to the Grand Duke, then turned and did likewise to the gathered crowd. She stepped over to Clayton, and just as he was about to take a sip of whiskey from his tin cup, she snatched it from him. After sniffing its contents in an exaggerated manner, she pinched her nose and tossed the liquid into the fire, which flared with a bright flame burning off the alcohol. As I watched her antics, I was beginning to think that she was quite the show person. I noticed that Buffalo Bill must have also thought so. He was watching her with arms crossed and a curious expression with half smile upon his lips. Angel continued her show. She held the cup aloft for all to see, even tossed it into the air and caught it in a most theatrical manner. Holding the cup aloft, she marched over to the woodpile for the campfire and placed it upon the top log in such a manner that the open end of the cup would face her. In the exaggerated manner of an accomplished thespian, she gestured toward her cup target then stepped off thirty long paces as the crowd counted along with her. Everyone was thoroughly enjoying her show. Very dramatically, she took her coat off and tossed it to me. With yet more drama, she withdrew her sling from her trouser’s pocket and stretched it out and held over her head for all to see that it was only two thongs and a leather piece to hold the projectile. The audience applauded. She then withdrew a .44 caliber lead ball from her pocket and pinched between forefinger and thumb, she held it aloft for her audience to examine. Alexei stood to the side obviously much amused by her antics, and Cody was very clearly interested in what she was doing. Angel carefully and deliberately placed the ball into the leather pouch of the sling and went to twirling it. I had watched her use her sling on many occasions, but I had never seen her twirl it the way she did that evening. While still facing the audience, she spun it on her right side, then on her left side, then alternating sides, then overhead. That spinning sling held her audience in its hypnotic grasp. As I said, she wasn’t even facing the target, it being on her left side some thirty paces away. Suddenly, she let out a Rebel yell, spun, and stepped toward the tin cup, letting fly the ball at her target, which promptly disappeared from the woodpile with a satisfying clang. Her audience cheered and applauded. Angel threw up her arms in victory. Cody was applauding enthusiastically while shaking his head in disbelief. Alexei stepped up to Angel and took her hand and held it aloft. She then curtsied like the finest lady-in-waiting in any European court. I reckon then that she had learned something in that expensive finishing school after all. Buffalo Bill ordered the cup retrieved and brought to him for examination. He found a deep dent almost dead center in the bottom of the cup. After receiving her accolades, she came over and stood beside me with a broad grin on her lips. Comments Off on “Buffalo Woman” is LIVE!